Highly detailed wall map to include roads, cities, waterways, geography and points of interest. 72" x 54"
The Baton Rouge, Louisiana Vicinity Wall Map measures 72 in. by 54 in. with up to date cartography. 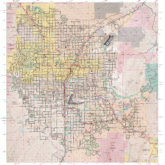 The map is printed in full color, laminated, and provides city indexing on the map’s face. Includes hanging rails mounted top and bottom.